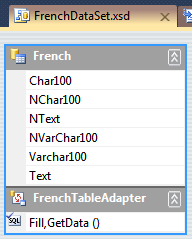 I am inserting French language text into nvarchar column in SQL server 2008. 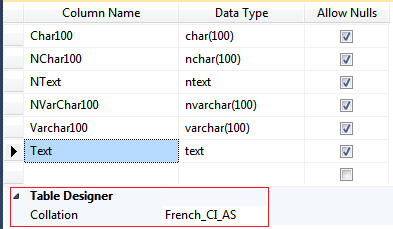 The French accented characters are not stored properly in the SQL DB. Please let me know why it does not work with SQL Bulk copy class. Any settings need to be changed or C# code needs to be modified to store the non-English characters properly. I am designing this table, the collation for every column is set to French_CI_AS, French culture, accent sensitive. Every sql string type considered. I am building a typed dataset for this table (not the purpose of this question). "Ã€Ã , Ã‚Ã¢, Ã†Ã¦, Ã„Ã¤"
Notice no invalid entries whatever the sql char type!. I tested your code on the following table and it worked fine, at least on SQL Server 2012.